2006年9月19日には、イーロン大学法科大学院（Elon University School of Law）における講演で司法の独立に関する懸念を再度表明した。. 2003年には、「法の尊厳－ある最高裁判事の回想」（The Majesty of the Law: Reflections of a Supreme Court Justice (ISBN 0-375-50925-9)）と題する本を著した。. E.J. Montini. "Rehnquist is No. 1, O'Connor is No. 3, Baloney is No. 2. ", Arizona Republic, (July 12, 2005). Sandra Day O'Connor and H. Alan Day (2002). Lazy B: Growing Up on a Cattle Ranch in the American Southwest. Random House. ISBN 0-375-50724-8. ^ McCaslin, John (2001年11月7日). “Power Women”. McCaslin's Beltway Beat (Washington, D.C.: Townhall.com). http://www.townhall.com/columnists/JohnMcCaslin/2001/11/07/mccaslins_beltway_beat 2009年6月15日閲覧. "… Ladies' Home Journal, … ranks the 30 Most Powerful Women based on cultural clout, financial impact, achievement, visibility, influence, intellect, political know-how and staying power. Sen. Hillary Rodham Clinton ranks 5th on the list behind Miss Winfrey, Supreme Court Justice Sandra Day O'Connor, Martha Stewart and Barbara Walters"
^ CNN Newsroom, Cable News Network, 1:45 PM on November 14, 2007. ^ 'Seized by Alzheimer’s, Then Love", New York Times, November 14, 2007. ^ a b James Taranto, Leonard Leo (2004). Presidential Leadership. Wall Street Journal Books. http://books.google.com/books?id=zxBAnuWpg5kC 2008年10月20日閲覧。. ^ Greenburg, Jan Crawford. Supreme Conflict: The Inside Story of the Struggle for Control of the United States Supreme Court. Penguin Books. Page 222. ^ a b Greenburg, Jan Crawford. Supreme Conflict: The Inside Story of the Struggle for Control of the United States Supreme Court.2007. Penguin Books. Page 222. ^ Greenburg, Jan Crawford. Supreme Conflict: The Inside Story of the Struggle for Control of the United States Supreme Court.2007. Penguin Books. Page 222-223. ^ Greenburg, Jan Crawford. Supreme Conflict: The Inside Story of the Struggle for Control of the United States Supreme Court.2007. Penguin Books. Page 223. ^ a b Greenhouse, Linda. Becoming Justice Blackmun. Times Books. 2005. Page 141. ^ Greenburg, Jan Crawford. Supreme Conflict: The Inside Story of the Struggle for Control of the United States Supreme Court.2007. Penguin Books. Page 68. ^ Greenburg, Jan Crawford. Supreme Conflict: The Inside Story of the Struggle for Control of the United States Supreme Court.2007. Penguin Books. Pages 122-123. ^ Greenburg, Jan Crawford. Supreme Conflict: The Inside Story of the Struggle for Control of the United States Supreme Court.2007. Penguin Books. Page 123, 134. ^ Greenburg, Jan Crawford. Supreme Conflict: The Inside Story of the Struggle for Control of the United States Supreme Court.2007. Penguin Books. Page 123. ^ Greenhouse, Linda. Becoming Justice Blackmun. Times Books. 2005. Page 183. ^ Greenburg, Jan Crawford. Supreme Conflict: The Inside Story of the Struggle for Control of the United States Supreme Court. 2007. Penguin Books. Page 80. ^ Nager, Glen D. (3 2006). 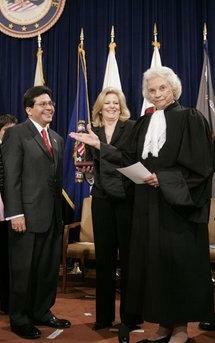 “A Tribute to Justice Sandra Day O'Connor” (PDF). Harvard Law Review (マサチューセッツ州ケンブリッジ: The Harvard Law Review Association) 119 (5): 1250. ISSN 0017-811X. OCLC 46968396. http://www.harvardlawreview.org/issues/119/march06/oconnor_tribute.pdf 2009年6月15日閲覧. "Though SOC is not one to brag about her own accomplishments, she does manage to ask in most conversations about golf whether she has "mentioned that I have a hole-in-one?"" "O'Connor not bothered by delayed retirement. ", Associated Press September 28, 2005. "Sandra Day O'Connor prepares for final days on Supreme Court. ", Associated Press September 19, 2005.